Gotha was closed by the terms of the Treaty of Versailles, but in 1933 the company resumed aircraft manufacture, and its first product was the Go 145 trainer. This first flew in February 1934 with a fabric-covered all-wood airframe, and was ordered into immediate production as a Luftwaffe basic trainer with the designation Go 145A. 9500-10,000 aircraft were built, including BFW and Focke-Wulf, and such was the utility of the type that in World War II large numbers were used by the Storkampfstaffefn (later Nachtschfachtgruppen) to harass the Soviet forces. The type was also built in Spain as the CASA 1115-L, and in Turkey. 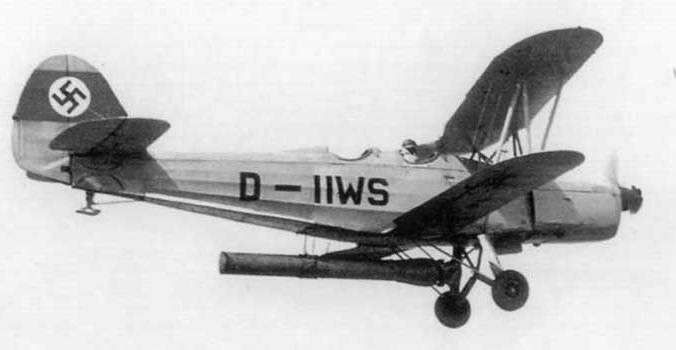 German variants were the Go 145B with an enclosed cockpit and landing gear spats, and the Go 145C gunnery trainer with a pivoted 7.92-mm (0.312-mm) machine-gun in the rear cockpit. Span: 9.m (29ft 6.25 in). Length: 8.7m (28 ft 6.5 in). Powerplant: l x Argus As 100, 179kW (240 hp). Max TO weight: 1380 kg (3,043 lb). Max speed: 132 mph at sea level.